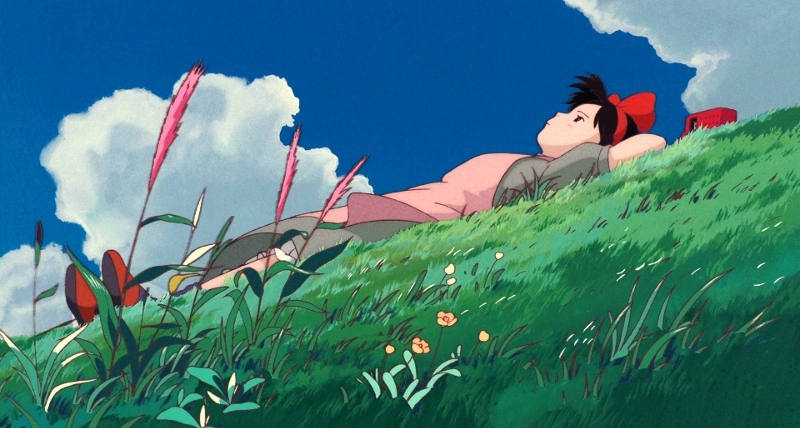 An extremely thoughtful coming-of-age tale with no traditional villains in sight, Hayao Miyazaki's Kiki's Delivery Service (1989) was only the director's third project for Studio Ghibli after Castle in the Sky and My Neighbor Totoro. 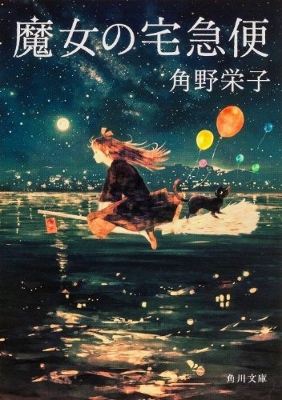 Adapted from Eiko Kadono's popular 1985 novel, our title character is a sweet-natured 13-year-old witch who's ready to leave home for a year of independent training. Bidding her parents and friends goodbye, Kiki's only two material possessions---aside from her plain black robe and a bright red hair bow---include her mother's broom and father's portable radio. 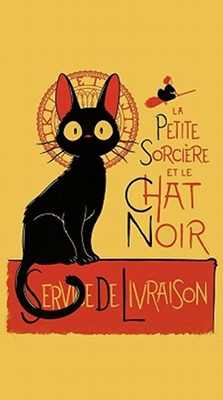 With trusty black cat Jiji in tow, the young girl flies towards a town by the sea to find out what her future holds. 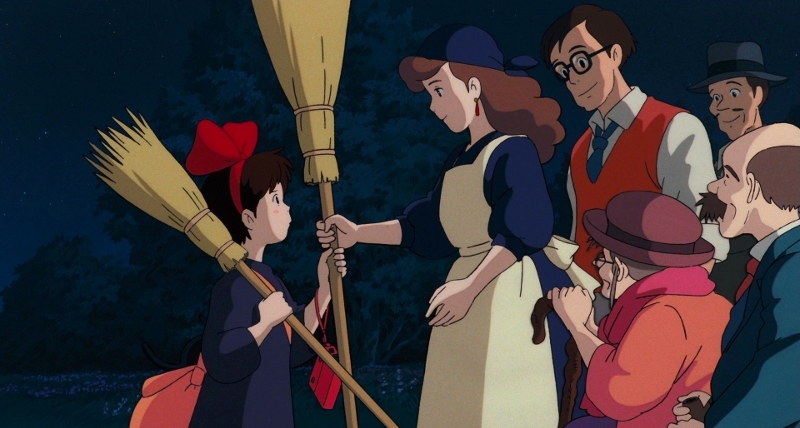 Kiki's first two interactions are with Tombo, a teenage boy who's fascinated by flight and thus attracted by her abilities; and a hospitable bakery owner, Osono, who repays a good deed by letting Kiki stay in a vacant room upstairs and start a delivery service. Yet despite her good luck and sweet disposition, Kiki can't help but lose confidence in the coming weeks: Tombo's friends leer at her clothes, her delivery job has a few rough spots, and Jiji spends most of his free time with an uppity neighborhood cat. Like most people in their teens, early 20s, and beyond, Kiki has quickly discovered that life isn't turning out as well as she hoped...and before she knows it, her magical abilities are fading away. Far from a cynical or overly romanticized take on adolescence, Kiki's Delivery Service has an obvious knack for capturing the ups and downs of a young life as it slowly develops during turbulent times. Like My Neighbor Totoro and Spirited Away (not coincidentally, my two favorite Miyazaki films), in addition to several other films in the Ghibli catalog, there's a real sense of character development and growth that's handled much more delicately than expected; considering its source material and main character, this is one of the studio's more grounded films by a long shot. Featuring a superb soundtrack by the prolific Joe Hisaishi (who collaborated on every Miyazaki film since 1984) and wonderfully detailed animation, it's the kind of simple and understated family film that's all but gone extinct in recent decades: one that treats its characters and audience with a great deal of respect while gently teaching them in the process. Originally released on DVD in 2003 by Disney (and again in 2010), Kiki's Delivery Service received a Blu-ray upgrade from the studio less than three years ago. GKIDS' brand new Blu-ray edition, like Princess Mononoke, arrives as part of a substantial Ghibli re-release wave after they acquired the distribution rights from Disney earlier this year. We'll have more reviews up soon including Spirited Away, My Neighbor Totoro, Howl's Moving Castle, and Ponyo. Disney's 2014 Blu-ray featured a suitably strong and stable 1080p presentation sourced from a recent master, and unsurprisingly GKIDS' new Blu-ray looks more or less identical to my eyes. Though I don't have the tools to to a side-by-side comparison (either on-screen or via captures), I spot checked a handful of scenes from both discs and found no major variances in detail, texture, black levels, compression, bit rate, and color balance. Quite simply, both looked fantastic and virtually flawless, aside from trace amounts of banding during a handful of tricky gradient scenes. Overall, this seems to be a clear case of "if it ain't broke, don't fix it", so fans will have no reason to be disappointed here. 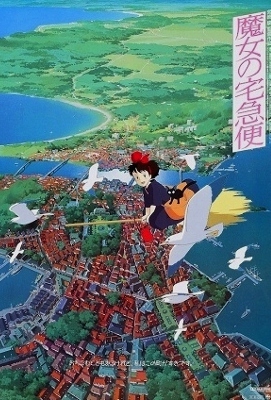 Like the Disney disc, viewers can choose between the original Japanese 2.0 track or an English 2.0 dub (featuring the likes of Kirsten Dunst, Phil Hartman, Debbie Reynolds, and more, recorded all the way back in 1997 and included on just about every previous Region 1 release of Kiki's Delivery Service). Unfortunately, this English track suffers from the same audio mixing defect as Disney's Blu-ray, in which the dialogue has a slight buzz that makes it sound as if everyone's talking into a fan. (A better explanation of this defect can be heard here.) Either GKIDS couldn't fix this or simply wasn't aware of it...but depending on your audio preferences, it's either a deal-breaker or a total non-issue. I've always been partial to the original Japanese, so I'm definitely more in the "non-issue" camp and mainly focused on that track during the show. It's a great mix with crisp dialogue, a surprisingly wide sound stage, and even a few effective uses of LFE along the way. 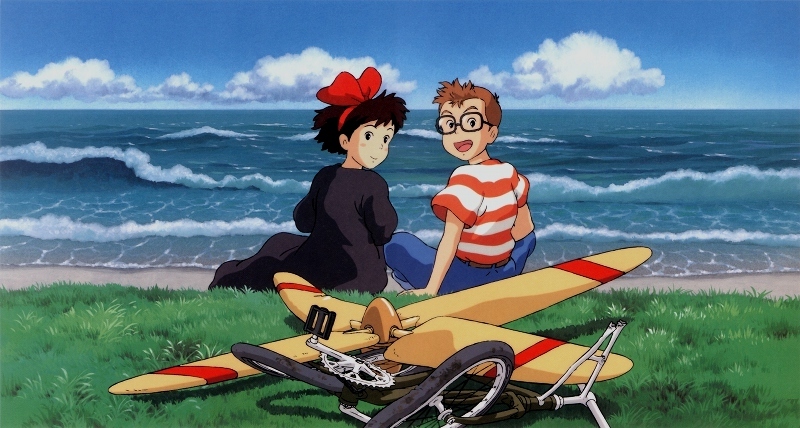 Naturally, the most enveloping moments are during Kiki's flights and scenes in the busier parts of town, while Joe Hisaishi's original score also enjoys a strong presence without overpowering the dialogue. Like the previous DVD and Blu-ray, optional subtitles are available as both dubtitles (for the English version, naturally) and a literal English translation of the Japanese track, which has been provided by Studio Ghibli according to the packaging and differs quite a bit at times; character personalities are different and a few religious references are included, just for starters. The chosen audio setting also changes on-screen text to match, including a handful of street signs and the opening/closing credits, and even embellishes Joe Hisaishi's original score with a few additional music cues and effects (with Miyazaki's blessing, of course). An optional French dub and subtitles are also included. Everything from Disney's 2014 Blu-ray, basically. These recycled extras include Original Japanese Storyboards that play during the film, a collection of Trailers (8:06), several short featurettes ["Creating Kiki's Delivery Service" (2:26), "Kiki and Jiji" (3:27), "Flying with Kiki and Beyond" (2:50), "Ursula's Painting", and "Collaborating with Miyazaki" (1:47)], the rather substantial "Locations of Kiki" (29:11), the music-minded "Scoring Miyazaki" (7:18), and another installment of "Behind the Microphone" (5:00) with a young Kirsten Dunst, the late Phil Hartman and Debbie Reynolds, and more. Kiki's Delivery Service is a deceptively layered coming-of-age tale that, like My Neighbor Totoro and Spirited Away, you don't need to be a young girl to appreciate. There's almost no action, few main characters, and absolutely no traditional villains (or external conflict) anywhere, yet the simple story and unique perspective make it an appealing, memorable film from start to finish. Although it's not in the highest tier of Studio Ghibli titles, this one isn't very far off and enjoyable to revisit every so often. Aside from slightly better packaging, GKIDS' new Blu-ray is pretty much the same as Disney's disc, from the A/V presentation (including a defect on the English dub which hasn't been corrected) to the bonus features---the only difference is what appears to be a slightly revised subtitle track. It's not exactly worth a double dip if you own Kiki's Delivery Service on Blu-ray already, but newcomers should consider it Recommended.